A second attempt will made to show a film' s regional premiere at Hereford Cathedral after the projector broke down 30 minutes into it. 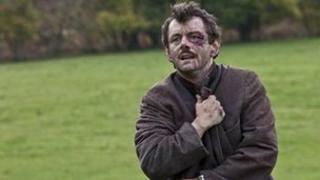 The first showing of Resistance, starring Michael Sheen which was filmed on the Herefordshire border, had to be abandoned on 21 November. The new showing on Tuesday, 6 December is restricted to people who had tickets for the original fundraising evening. The money raised will go to the Hereford Cathedral Perpetual Trust. Glynn Morgan, from the trust, said: "It was such a shame that a technical problem with the projector meant that the first showing had to be abandoned, but everyone has been so kind. "The film has received tremendous coverage over the past few weeks and we look forward to welcoming as many of our guests as possible back to our re-screening." The film, set during World War II, is based on the novel of the same name by Abergavenny author Owen Sheers. Resistance follows a community in the Olchon Valley, on the Herefordshire border with Powys, and shows what might have happened if World War II had taken a different course and Germany had invaded the UK mainland. The film was shot in the Olchon and Llanthony valleys last year. The directorial debut of Amit Gupta, Resistance also stars Andrea Riseborough and Tom Wlaschia.